Have You Heard of Weighted Blanket Therapy? The drug-free therapeutic blanket known as weighted blankets have become the at-home treatment for insomnia, anxiety, autism spectrum disorders (ASD), attention-deficit hyperactive disorders (ADHD), Restless Leg Syndrome (RLS), Asperger’s and sensory disorders. Many seniors, adults, teenagers and children face psychiatric issues that cause insomnia and severe anxiety. Patients with autism and other psychiatric disorders also face extreme anxiousness and the inability to induce calmness within themselves without the use of sedatives or drugs. 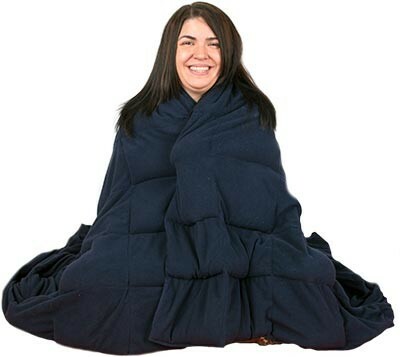 Image above: YnM Weighted Blanket. The combination of behavioral aberrations, and the lack of sleep among these people, have been known to lead to loss of productivity in their daily lives, irrational emotional behavior and out – of – character actions. It isn’t just the problem of not being able to keep their emotions under control, but the issue of lashing out aggressively due to psychological dysfunctions. The root causes of such behavioral issues are anxiety and insomnia, which is usually treated with pharmacological (drugs) and psychological (therapy) methods. However, now with a breakthrough in the study of sleep medicine and psychiatric disorders, we know that the trick to soothing consternation and inducing sleep is much simpler than once thought. Weighted blankets use deep pressure touch simulation (DPTS) to relax the body and make the patient feel safe, guarded and secure, which calms their unease and helps their body go to sleep. The sensory compression methodology facilitates a positive change with the comfort the blanket brings to its user. The weight of the blanket stimulates the receptors on your body which then activates the neurotransmitters in your brain to bring a sense of happiness to the person. The Poly plastic (Polypropylene) pellets that have been used to fill the compartments of the blanket provide the weightage of the blanket. A quality weighted blanket is quilted, made of either cotton or fleece and weighs about 10% of the user’s body. Using the proper blanket according to the size and the weight of the user will give the optimum calming results. This blanket has shown to be very effective in calming hyperactive children during bedtime, anxious patients in therapy and even adults undergoing chemotherapy. It has also proven to be efficacious in calming people down during anxiety inducing situations. – A 2008 study showed that weighted blankets are beneficial for anxiety. The study used a 30 lb. blankets on adults. In total, 63% reported a decrease in anxiety, and 78% found it calming. – A 2015 study used 30 pound blanket on adults during an inpatient mental health hospitalization. 60% of them reported significant decrease in anxiety after use. – Research on DPTS started as early as the 1950s. One article from 1992 found great benefits of this therapy for patients with autism. It reduces self-harming behaviors in autistic children, as well as produced better sleep. It also relaxes the muscles. 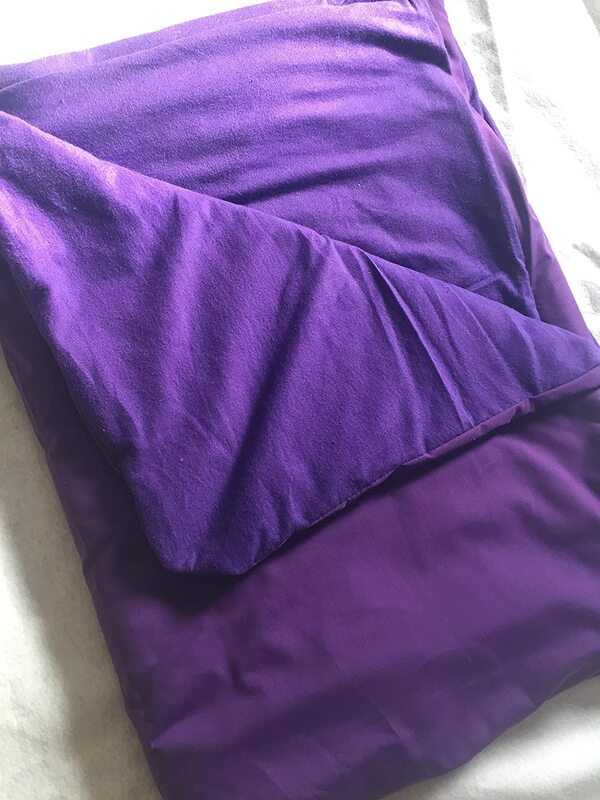 – Weighted blanket were also found to be very calming for babies. Insomnia is a sleep disorder that causes habitual sleeplessness. The lack of sleep leads to the over exhaustion of the human body and hampers the psychological well-being of the person. When a person is not able to function well, both physically and mentally, their social well being is affected and they begin to lose productivity in their lives. This leads to depression and other behavioral problems. An easy solution to this problem is the weighted blanket. 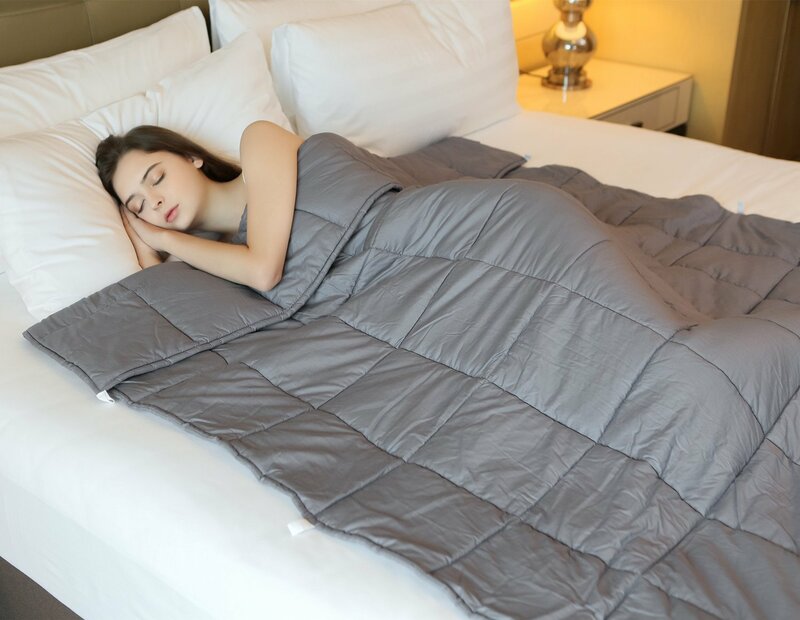 The pressure of the weighted blanket reaches deep within the body of the user to provide a comfortable environment for a person to fall asleep in. The sense of being swaddled and the physical connection that the user feels with the blanket makes them feel warm and safe. This helps their mind be at ease and they can be able to relax their body. The state of tranquility will help clear their mind and ensure a good night’s sleep. According to the ‘Positive effects of a weighted blanket on insomnia’ by the Journal of Sleep Medicine and Disorders 2015 of the SciMed Central, the weighted blankets had improved the sleep quality of people with severe insomnia. Research shows that hugs can actually make a person feel at ease. Hugging a person releases the hormone Oxytocin into the blood stream. This chemical reduces your blood pressure, calms your heart rate and provides and overall feeling of relaxation. Although the blanket does not provide a human connection, your body may perceive the warmth and security the imitation that a hug provides. Both the hug and the blanket use a gentle yet firm pressure that goes deep within the person’s body tissues. This gives the user a sense of repose and allows your body to relax. Being covered by a weighted and warm blanket will ensure the feeling of calmness in the user. The ‘blanket therapy’ stimulates the receptors present throughout our body, which lessens a person’s discomfort. Once the user feels more comfortable in the blanket, they begin to feel secure as their body begins to relax. The body can only relax when your mind is soothed and your heart rate is calmed. This change in the body will ensure that both your body and mind believes that you are secure and safe. Serotonin is a chemical messenger, also known as a neurotransmitter that your brain and intestines produce for the smooth functioning of your nervous system, which includes the brain and the nerves. This hormone is secreted to promote happiness and the mood of the people. Known as the ‘happy hormone’, this chemical does not only affect a person’s mood but it affects their behavior. The lack of serotonin in the body leads to depression, insomnia and anxiety. That is why the sensory stimulating weighted blankets increase the production of serotonin in the body. The hormone relaxes your body and makes you feel calmer. That sense of calmness leads to pacifying one’s anxiety, which results to inducing sleep in the user. Melatonin, also known as the ‘sleep hormone’ is a chemical that affects a person’s sleep. The hormone is produced with the production of serotonin, as well as the pineal gland in the brain. This chemical is known to ease insomnia and induce sleep, which is possible through the therapeutic benefits of the weighted blankets that provide a gentle yet firm pressure on your body by stimulating your receptors. Autism spectrum disorder includes Asperger’s, Autism, Rhett Syndrome and other unspecified Pervasive Development Disorders. Such disorders include behavioral problems that do not necessarily bode well with the norms of society. The patients suffering from such disorders feel aggression and irritation due to the inability to express or convey their thoughts clearly. Such slow cognitive development makes the patient unable to process information quickly and the change in their surroundings. Patients with such disorders are not able to communicate properly, so they use erratic speech, repetitive actions and turbulent behaviors. During a frustrated outburst, the patient’s heart rate increases, their breath becomes shallow and their blood pressure rises – which further increases their irritability. When the patient is going through such tempestuous emotions and tantrums, it is best to drape the weighted blanket around them or have them lay down with the blanket covering them. This will make them feel more relaxed and comfortable. Once they are no longer acting in a hysterical manner, they will be able to think with a clearer mind and a calmer body. Although communicating with their caretakers might still be difficult, there will at least be an opportunity for the patient to gather more patience and attempt to convey their thoughts in a more serene manner. Some psychiatric disorders make people oversensitive to touch. Patients with Autism Spectrum Disorders usually face such discomfort with the touch of other people but this can be overcome by introducing the weight of the blanket regularly to the affected patient. The pressure of the blanket provides a similar feeling of human touch at a larger scale without actual connection – which can be a stepping stone in helping patients overcome their fear of touch. During the 1990s, a squeeze machine was used to help patients overcome their oversensitivity to touch. Today, with the inception of the ‘therapy blankets’, patients can use the more accessible and less controversial mechanism to help people become more at ease with touch. Obsessive Compulsive Disorder or OCD drives a person to think repetitively about a certain incident or an object. Such thoughts constantly play across a person’s mind and lead them to neglect their duties and their personal lives. The patient becomes anxious about a particular event and conducts a certain action over and over again. Their thoughts are occupied and their bodies refuse to break out of an obsessive reverie. A very effective way to ease an OCD patient’s anxiety, and to treat the inability to calm them down from a mind consuming thought is to use a weighted blanket. This blanket allows the patient to feel safe and secure without worrying about the numerous issues that may be present in their lives. The blanket provides a warm environment for the user by helping to relive stress and allow their mind to release the captivating thoughts. Draping the weighted blanket over the user’s body distributes pressure evenly throughout their body. This has similar effects of a deep tissue massage. The pressure of the blanket goes deep within your tissues while you use it to fall asleep. A massage is supposed to help our body and mind relax – which can be easily done at home by using a weighted blanket. The physical factor of a massage might provide it’s own intimate yet soothing aspect, but the weighted blanket is proven to give you similar results to an actual massage in the long run. Taking a look at the overall therapeutic benefits of weighted blankets, we can see that it relieves stress, reduces tension, induces sleep, calms your mind and relaxes your body. These components are very important if you want to live a healthy and happy life. Raised blood pressure, anxiety and lack of sleep are truly killers of productivity and normal behavior. Sleeping with the weighted blanket promotes the users overall well-being by ensuring that they tackle their daily issues with a clear head and a well-rested body. With a clear mind, a person’s cognitive functions are improved. They are able to perform efficiently and effectively without being burdened by psychological issues and behavioral changes. Weighted blankets can potentially solve sleep issues, panic attacks, anxiety related disorders, lack of concentration and even aggressive behavioral problems that affect the smooth proceedings of one’s daily life. Successful results of the weighted blanket can be had without the high costs of therapy sessions, drugs and sedatives that are traditionally used to pacify more tremulous patients. I recommend giving this effective and inexpensive blanket a try. Read consumer experiences with weighted blankets. 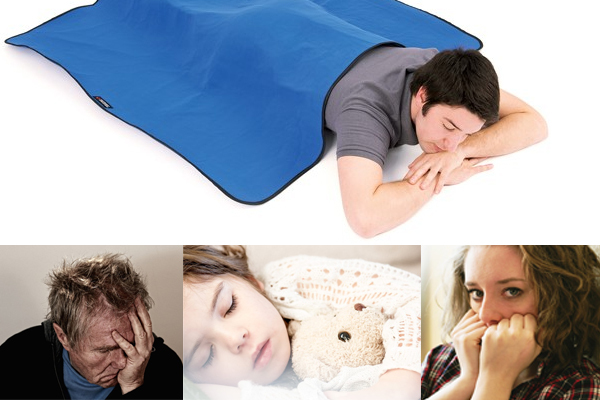 The blanket can be used at night, during naps, or used casually quick calming effect. Studies have used it for as little as 10 minutes and up to 2 hours, but it can stay on as long as you would like. It is the most beneficial to have your whole body covered, but do do not place the blanket on top of the head or face as it can create a suffocating sensation. Use the formula 10% of your weight plus one pound. For example, a 160 lb person should choose a 16 or 18 lb weighted blanket. I hope this article provided you some practical information on weighted blankets. Would you deliver a blanket and pillow to South Africa ?? How much is the blanket and how much is the pillow? Thank you for reaching out, Sandy. I recommend that you do an online search for a distributor in South Africa.